Miss Fake It 'Til You Make It: What are the Best Fast Face Fixes? What are the Best Fast Face Fixes? Your 20s are a transformative time for your social development, style exploration and most of all, your last chance to reverse premaster signs of aging. Notice after three glasses of wine that your body doesn’t bounce back as quickly? Well below the surface, the effects of stress, pollutants and environmental hazards are taking a toll on your youthful appearance. Before you buy discount Botox on Gilt, try to repair the damage through science and elegance. Lately we are loving Caudalie. This luxurious line has harnessed the skin enriching power of vineyards to develop the latest breakthrough. Their latest innovation PREMIER CRU features Resveratrol-Oleyl, polyphenols and Viniferine to overhaul skin’s health, luminosity and nourishment. This powerful potion delivers ultimate anti-aging action for visibly more youthful skin. It’s rich consistency leaves skin feeling velvety-smooth. The completion contouring agents deliver a firmer, more radiant skin tone for nourished decadence throughout the day. Give the delicate eye area some extra attention. Instantly hydrate dry, tired eyes with a caffeine infused formula to reduce dark circles and puffiness. Plus for an added bonus, this fountain of youth contains 10% pearlizers and powders to minimize fine lines and trouble spots. WHAT: An exclusive Premier Cru preview event. Be one of the first to experience the ultimate in anti-aging at our new NYC boutique. Experience a free Premier Cru facial, meet the founders, enjoy a glass of wine from the family vineyard and receive samples of the new products. HOW: Space is limited. 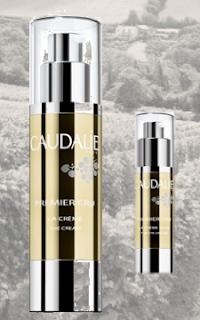 To register, please visit www.caudalie.com/premiercru. 21 and older only.